Daily Edmonton (EM) allocation added - buses running light to line of route. Edmonton (EM) allocation withdrawn - Stamford Hill (SF) added. RM1616 is seen heading along Upper Clapton Road near Filey Avenue . Running as far as the Nags Head in Holloway, it's out as SF24 on route 253. New to LT equipped with a throaty Leyland O.600 engine in the middle of June 1963, this example entered service at Muswell Hill (MH) Garage just three days later. Mon-Sat Clapton (CT) allocation added. Sunday Clapton (CT) added DM and RML types introduced. Mon-Sat Dalston (D) allocation introduced. Sunday Dalston (D) allocation introduced. Dalston (D) allocation withdrawn with garage closure. Clapton (CT) withdrawn. Mon-Fri Ash Grove (AG) allocation introduced. Sunday Ash Grove (AG) allocation withdrawn. RML type introduced at Stamford Hill (SF). Withdrawn between Mornington Crescent and Warren Street. Extended from Mornington Crescent to Euston via Eversholt Street. 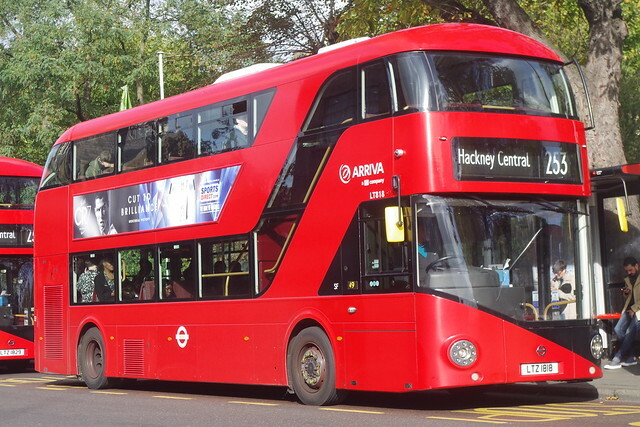 Withdrawn between Hackney and Aldgate - this section covered by new Route 254 running between Holloway and Aldgate. Rerouted northbound in Camden direct via Eversholt Street instead of Harrington Square. Changeover point probably Stamford Hill but buses ran dead from Stamford Hill on journeys to garage. I was just looking at the histories of various London bus routes at your site "Buses at Work". I notice that you have a question mark as to the changeover point for Dalston crews on this route. The point used was Hackney Well Street in both directions. Interestingly - I noticed that when I switched to Stamford Hill - the running cards for the 253 at this garage did not have a timing point at Hackney Well Street - while those from Dalston did - regardless of whether there was a changeover on that journey. Strictly speaking - crews were expected to use the 236 bus to travel the appproximate half mile from Dalston Garage to this changeover point. However - the 236 was not a frequent route and - as I am sure you are aware - the bus service in London was crippled at that time by a tripple whammy of traffic congestion - staff shortages and frequent vehicle breakdowns. Consequently - there was no point whatsoever in waiting for the 236 when setting out since gaps of up to an hour used to occur on this service - so crews mostly used to make their way on foot to and from this changeover point. Dalston crews on the 253 would take their mealbreaks at Hackney garage canteen - this garage being just round the corner from the Well Street stop. At other times - the distance between the garage and changeover point was the cause of a lot of discontent for the crews on this route. The shortest way of getting from Dalston Garage to Well Street involved walking across a small park known as London Fields and through an alleyway. As you might appreciate - this was not a very salubrious part of London - and many crews preferred to take the longer walk along the 236 bus route. It was not so bad during daylight hours - but after dark the decision as to the best way to return to the garage always posed a dilema. As a conductor - it was not so bad if you were setting out to start a shift because you would not be carrying any money - but I remember there were a number of shifts that involved coming off at Hackney Well Street in the evening and then you had to make your own way back to the garage to pay in and sign off. You were personally responsible for the money until you paid it in. Crossing London Fields at night was too great a risk - and it is was still possible that you could be robbed while walking along the Road served by the 236. In theory we were supposed to be able to get an overtime chit for the time we had to wait for the next 236 to pass by and take us to the garage - but I remember that in practice getting a chit under these circumstances from the garage inspectors was like getting blood from a stone - especially if you were asking for something like 45 minutes overtime - even if that was the actual time you had to wait for the first bus to come. Anyway - enough about Hackney Well Street. I would also like to point out that the changeover point for buses on the 253 operating from Stamford Hill (at the time I worked there in late 1980 - early 1981) was Stamford Hill Broadway - not Stamford Hill Common. At that time - all routes operating from Stamford Hill changed crews at the Stamford Hill Broadway stop - at which inspectors were on duty. It is true that the Stamford Hill Common stop was actually closer to Stamford Hill garage - and this is where staff travelling to/from work on that route may have alighted or boarded - and I am sure at times conductors on Warren Street bound vehicles may have stretched the rules and jumped off here - leaving the vehicle conductorless for one stop (although I never heard of this being done) - but this was not the official relief point at that time - I don't know if this changed later. I hope some of these points are useful to you. I will look at your descriptions of some other routes I have worked on and see if there is anything I can add.